Sometimes a movie comes along that is like that one kid you knew in school who wasn’t dorky enough to be a dork, wasn’t smart enough to be a nerd, but wasn’t cool enough to be accepted because he was a little too unpredictable and crazy. Burnt, by director John Wells (August: Osage County, The Company Men), is just one such a film. 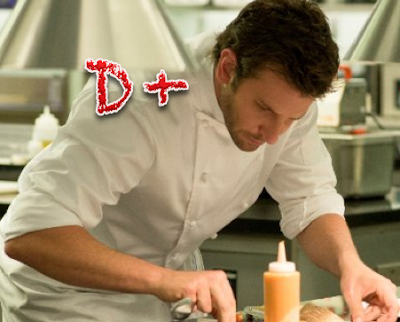 Its main character is “Adam Jones” (Bradley Cooper) who is a prodigy in the kitchen, but whose personal demons manage to consume him. The movie takes off after his name-making time as chef of a famous 2-Michelin star eatery. He finishes out ingloriously as he turns to a life of drug and alcohol addiction, in which he becomes indebted to organized crime and ruins the lives of those closest to him. As the movie opens, Jones is chucking oysters in a New Orleans restaurant, counting down every last one chucked before heading back to London to rebuild the ruins of his life and fulfill his ultimate dream—to take a 2-star restaurant and make it a 3. And the film gets one thing right; addicts are notoriously selfish…and damned if Jones won’t use and abuse absolutely everything and everyone in his path to achieve his dream. To say that he is a prick or an a-hole is not even cutting it. Jones may be the best, but he’s as arrogant as they come and his management style involves regularly destroying dishes and actually physically assaulting those who work for him. Adam Jones is an unlikable character, and as such, his movie isn’t so much about his redemption as it is his selfishness finding a new outlet. He manages to convince his old partner (Daniel Brühl) to give him another chance. When he gets it, he gets together a group of young talent from London and begins to gain traction. His star player is “Helene” (Sienna Miller), a cook who, out of little more than sheer desperation, puts up with Adam. Burnt is a film that doesn’t do well. It can’t because it gives us too little backstory, and what it passes up and brings us into we don’t care that much about. While Burnt will certainly make you hungry, the characterizations of nearly everyone are either too dry or somehow not aligned right emotionally. People don’t react as they should or would to a host of situations. The dialog is mostly drab and obscure. Worse yet, the supporting cast doesn’t get much opportunity to do their stuff. Uma Thurman (Kill Bill Vol. I & II, Pulp Fiction) is in only one scene as a revered food critic. Jones’ therapist (Emma Thompson) plays but a small part in the movie and might as well have been left out. Omar Sy plays a friend and fellow chef with Adam, but we know next to nothing about his past. Sy’s character (a pivotal one, no less) remains just a figure behind a murky veil that is never taken away. Not all dramas about life-restorative changes are effective, but what really gets me is why this heap was billed as a comedy-drama in the first place. The film is in no sense funny. In fact, it feels as though it was written by an inappreciative and depressed 2nd-year psychology student whose parents paid for his whole education up front.